A day pack is a great way to haul around a limited amount of your belongings. Whether you are planning a quick weekend away or are looking at a few day trips within a longer vacation and want to bring some sunscreen and water with you a day pack is a great option! Which Day Pack Is Your Favorite? A good day pack is comfortable to wear, and spacious enough to hold some key items. It is also easy to get in and out of. 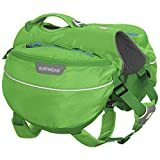 Below are the seven best day packs you can get on Amazon. So pick which style is best for you, and pack up the things you cannot do without! This is a great day pack to throw in a larger piece of luggage. It folds down into itself for easy storage and packing, but when unfolded, becomes a 35-liter backpack. This day pack weighs less than a pound, consists of one large zipper pocket, and two smaller zipper pockets, and has two mesh water bottle sleeves. There is a chest strap that clips the two shoulder straps together for comfort and stability, and it even comes in nine fantastic colors. If you are going on an extended camping trip, but want an easy way to pack some sunscreen, bug spray, a sweatshirt and some extra water, then this day pack is the solution for you. This brand is super trendy right now, and for good reason. Fjallraven backpacks are spacious, comfortable, and practical. They are made of dirt and water resistant vinylon, consists of a laptop sleeve, a main zipper pocket, front zipper pocket, and two side pockets. The Fjallraven logo on the front is reflective, which makes it a safe backpack to wear in darkness. This stylish day pack comes in dozens of colors, from bright color combos to muted neutrals. So if you want to be on-trend and prepared for anything, grab a Fjallraven and hit the road. If you aren’t a fan of wearing both straps of your backpack (maybe you went to high school in the 90’s) then you should invest in a day pack that is designed to be worn over one shoulder. It can be worn across your back or your front, and consists of three zippered-pockets. 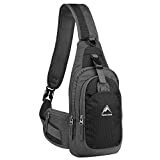 The main pocket has a sleeve to hold a small laptop or tablet, the smaller zipper pocket has two smaller sleeves, and the small zippered pocket on the shoulder strap is great for cash, keys, or other small valuables. Also, the shoulder strap has a built-in snap closure, so you can take it on and off easily without having to lift it over your head. It even comes in six great colors. This is another collapsible backpack – which automatically makes it a great option to throw into a larger piece of luggage. This pack is great for adventure travel. The shoulder straps are made of mesh which is great for ventilation. This day pack is made of water-resistant fabric which will protect your items from rain, splashes, and spills. It consists of a large zipper pocket, a smaller front zipper pocket, and a large mesh sleeve in the front. It comes in seven fun colors, and packs down into a little sleeve that has its own strap. If you want an easy way to get in and out of your day pack, this design is perfect for you. Instead of unzipping the main compartment and struggling to get your items out at an awkward angle, you can just unfold the entire top of this pack and open up the whole thing! To close it, you fold the top back over, and the clips on the side snap to the bottom of the bag to keep your items secure. In addition to the easily accessible main compartment, there are two front zipper compartments to store small or delicate items. It comes in a black and white two-tone design, which is sleek and matches anything you’d like to wear. But there are other color options if you prefer. This is a great day pack for transporting a laptop, or for a weekend getaway. 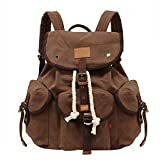 If you are looking for a more rustic or classic look in a day pack, then this is a great solution for you. 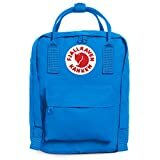 This day pack is made of a sturdy canvas material with leather trim. It has an over-flap top design with a drawstring closure, a front zipper pocket, and two side zipper pockets. There is even a small hidden zipper pocket on the back that sits right against your body, which adds security. It comes in an amazing variety of 17 colors. One reviewer gave it a rave review highlighting its features, stating that she was able to several items for a four night trip to Disneyland! This day pack also has room for a laptop if needed. If you want to bring some items with you on a long walk, but are not a fan of wearing the day pack yourself – then you can buy this day pack for your best furry friend! This day pack sits right over your buddy’s shoulder blades and distributes the weight of your items equally on either side. It snaps around his or her torso comfortably and has a padded handle on top for you to easily grab your buddy. It comes in four fun colors, so you can coordinate to your dog’s coat. The pockets are large and can carry quite a few items for both you and your canine hiking companion. This is a great option for anyone looking to go exploring with man’s best friend. Is Amazon the best place to shop for luggage?